Hosted by the Zeta Tau Alpha Sorority, they decided to put the event for the chapter’s philanthropy for Breast Cancer Education and Awareness. Director of Fundraising Johnna Metcalf came up with the idea after watching the Cubs-Indians World Series when they took turns hitting home runs. More importantly, Metcalf has a personal connection to Breast Cancer herself. Since losing her mom’s best friend to Cancer last year, she wanted a way to give back to her and everyone who suffers from this disease. 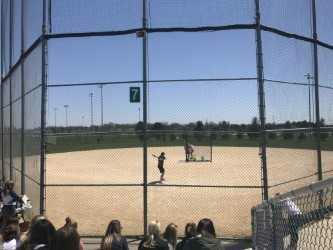 Just under 90 teams signed up to compete in the mock home run derby, and were equally spread out over three fields: beginner, intermediate, and expert. All 30 teams per field competed for a top-10 spot, and eventually a spot in the finale. Leading up to Sunday’s event, the ISU chapter spent all week fundraising for the event and encourage students to attend. The ISU chapter still needs to tally their final numbers, but leading up to the event, they raised roughly $24,000 and are confident that they will reach their $25,000 goal. Although it was their first event, the outcome exceeded Metcalf’s expectations. Metcalf added that they will continue to put on the event until pink is not just a color, but a symbol that reminds everyone to ‘Think Pink.’ Those encouraged to find out more about the organization can visit http://illinoisstate.zetataualpha.org/.